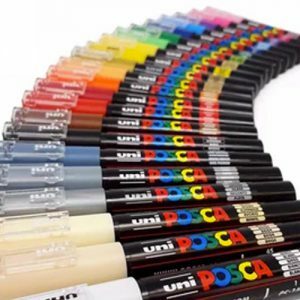 Posca pens were founded in 1983 and the markers have earned a reputation as one of the best paint pens around. Used by both the business and urban art communities, Posca paint pens can write on a whole variety of different surfaces. Posca paint pens produce bright, vivid colours for illustrations and hobbies and are well known to provide a smooth and even application. Paint pens from Posca can write on many surfaces and are great pens to write on glass, plastic, metal and wood. Indeed, many famous graffiti artists use posca paint pens above all others. Whether you need a fine-tip posca pen or a thick paint pen we have a wide range of markers available for you. These water-based pigment inked pens are lightfast and water-resistant and write on virtually any surface and have been used to create surfboard designs as well as stand out messages on chalkboards, blackboards and walls.